Safe House is a fun, if not entirely routine, piece of genre fare. The setting -- some of the shadier parts of Cape Town, South Africa -- lends itself neatly to the premise that the supporting cast of Gleeson, Farmiga, and Shepard are slumming it a bit. You can't quite say the same thing for Denzel, since he's been immersing himself in these types of pictures for years. Nor can you say the same for Ryan Reynolds, who doesn't quite have the prestige or box-office draw to fit the "slumming" charge. Looking at the film through this meta, "bigger picture" microscope, Reynolds is really the only one with anything to lose here. Fortunately, he proves game and exchanges his trademark wisecracks for the same kind of stoic charisma displayed in previous genre films like Smokin' Aces. It's just a shame he still hasn't picked a top-flight film to showcase his impressive leading man chops (mmmm... man chops). Reynolds plays Matt Weston, a CIA "housekeeper" -- a rookie in charge of a rarely-used South African safe house. Director Daniel Espinosa (apparently of Chilean-Swedish descent, because that's a thing) takes great pains early on to establish the tedium of Weston's position -- a position the audience can certainly relate to, having seen more than their share of these action movie tropes. But, as they so often do, things soon change with the arrival of Denzel's Tobias Frost (a surefire Bad Movie Name Hall of Famer), a rogue CIA agent and general badass. The usual fireworks ensue, leading inevitably to Weston's baptism by fire under the watchful (if not entirely willing) eye of Frost. If this sounds a bit like the aging Denzel passing the action movie torch to the younger Reynolds, that's because that's exactly what this is (à la Chris Pine in Unstoppable). The central conflict is (stop me if you've heard this one before) something about a super-secret file that will expose high-level traitors in all the big intelligence agencies. It's barely worth mentioning, largely because the film itself barely spends any time on it, window dressing for the action set pieces that it is. Said set pieces come at you relentlessly, both in number and execution. The whole film -- from exposition to car chase to shootout to denouement -- is chopped to hell by Espinosa and his team of (presumably) Chilean-Swedish sous chefs/editors. 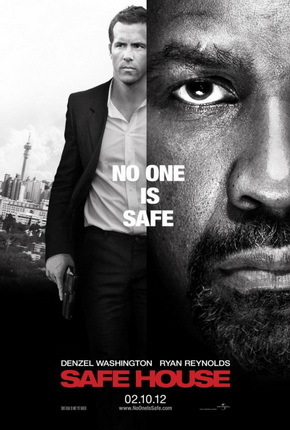 Safe House is the latest in the trend of handheld shot/quick cut action movies (and here I thought the trend was dying) -- only they don't stop at the action scenes. If the filmmakers can't be bothered to stop for three seconds to let an ancillary character explain the why the aforementioned file is so important, why should the audience care? They shouldn't and, I'm guessing, largely don't. Elements such as plot and character development are decidedly secondary in a paint-by-numbers actioner such as this. This is where the title really starts to make sense. For all the whizbang thrills and displays of gruff machismo, Safe House by and large plays it safe, sticking to well-established action movie conventions. I'm sure you can guess who lives out of the headlining duo, and if the one that doesn't make it has a quietly dignified death scene. Or if the file is recovered. If the bad guys get their comeuppance. Etc., etc., etc. While playing it that close to the vest means Safe House can't fail -- not really, not with its built-in safety net -- one can't help but walk away feeling disappointed. It's really too bad that, after biding his time for so long, Reynolds cannot get what Weston does -- a chance to really show what he can do when the pressure is on.